When choosing an engagement ring, there is more to consider beyond gemstone types. We covered popular center stone settings, and now we’ll share with you a few side stone setting styles. There are many options designed to enhance the gemstone’s beauty while reflecting the personality and lifestyle of its wearer. 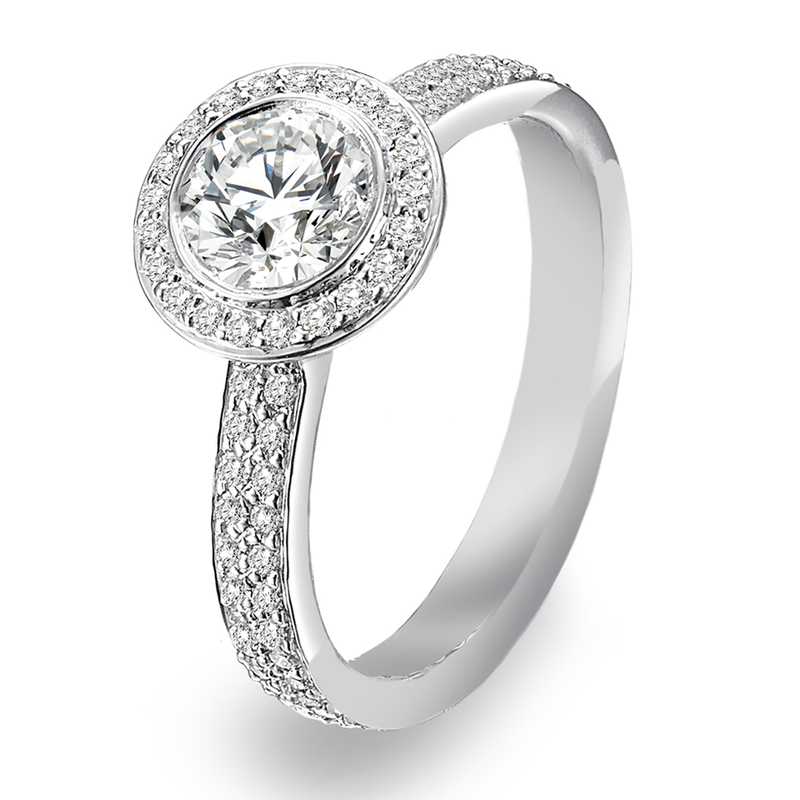 Platinum and diamond engagement ring with pavé diamond halo and side stones. Pavé is a type of bead setting where the gemstone is set into a recessed hole in the mounting and held in place by small beads of metal attached at the stone’s girdle. Many small gems are placed close together, usually in a honeycomb pattern, creating the appearance that the jewelry has been ‘paved’ with diamonds. Pave is an elegant setting. But if the wearer is extremely active, the diamonds can be vulnerable to falling out, and therefore should be handled with care. Platinum and diamond engagement ring with channel set side stones. Channel setting is a distinctive look created when accent stones are set into a grooved channel and laid edge-to-edge in a row. This design protects the gemstones, making this setting style ideal for daily wear and a good option for an active person. 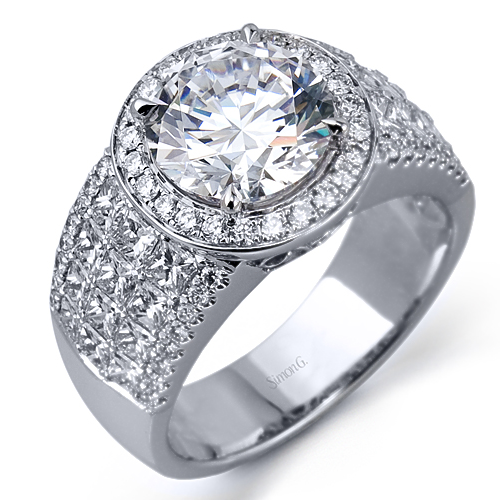 18K white gold ring, comprised of 1.56 ctw princess cut white Diamonds and 0.42 ctw round Diamonds. Invisible settings have multiple square-cut stones set edge-to-edge so none of the binding metal shows from the top and gives the appearance of a seamless diamond surface. 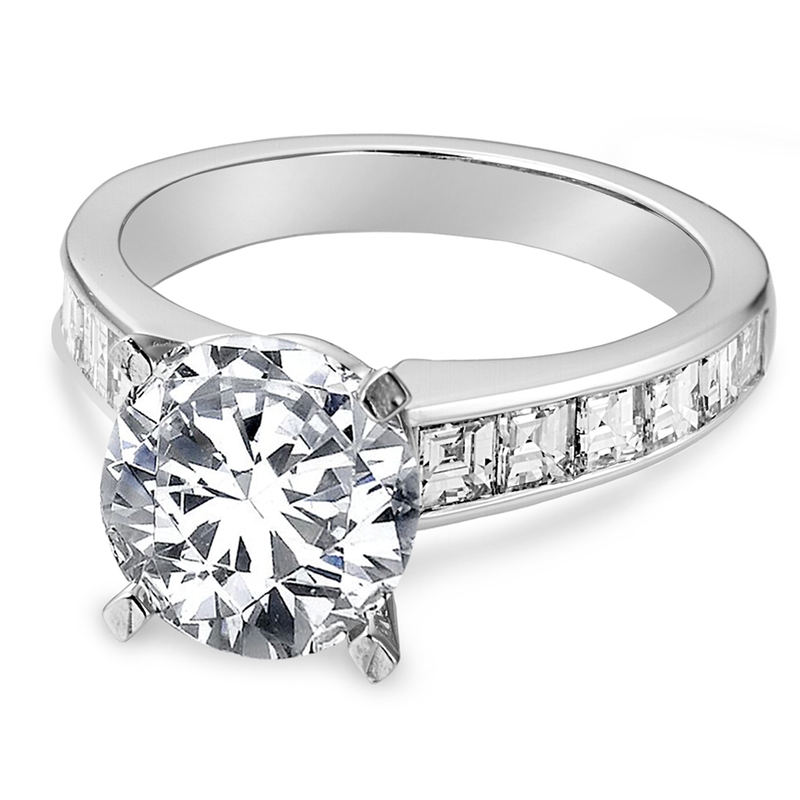 This style is used to either enhance a center stone with invisible set side stones, or multiple smaller diamonds can be clustered together to create the illusion of a diamond solitaire in the place of a single center stone. This beautiful setting is also somewhat fragile – something to consider when choosing a setting that will fit the lifestyle of its owner.